Nurturing creativity in a child is a challenge since they need to be suitably engaged with interesting activities. 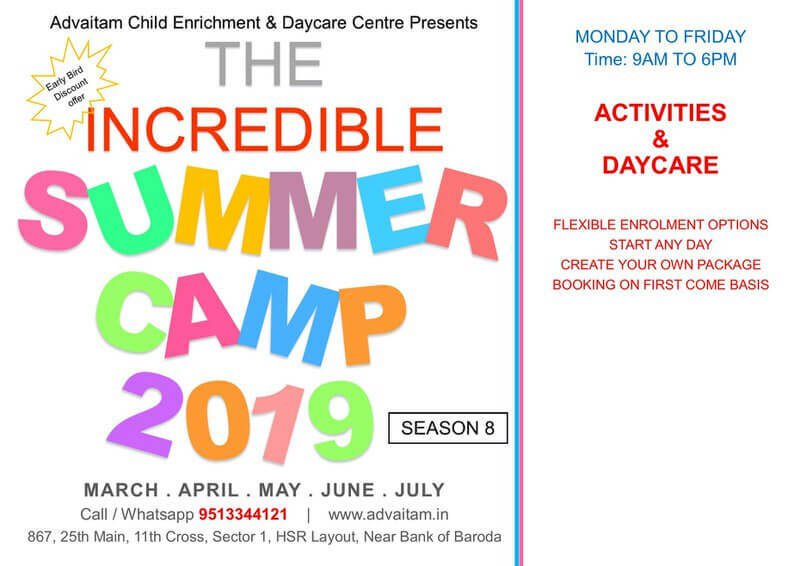 Why not choose a camp that will enrich your kids’ experience while exposing them to various art forms in a systematic manner? Check out our curated list. Art exposes kids to the rich Indian heritage, so also the treasure trove of art forms that are prevalent today. 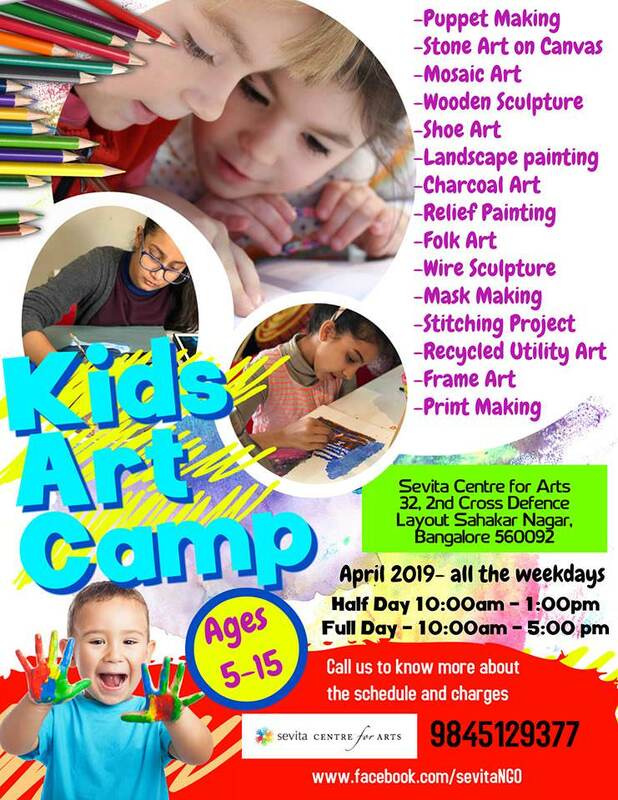 Summer Art Camps are an attempt to kindle the kids’ senses for finer things in life, to appreciate and indulge in creating forms of expression that go beyond words or action. 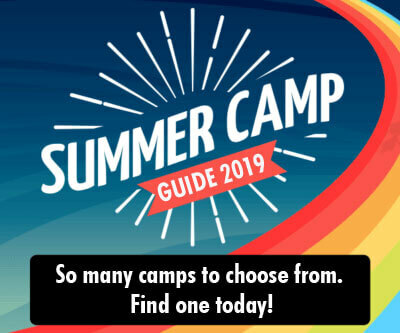 Here are top 15 Summer Art Camps that cater to every child and encapsulate a rich experience that will hold them in good stead for life. 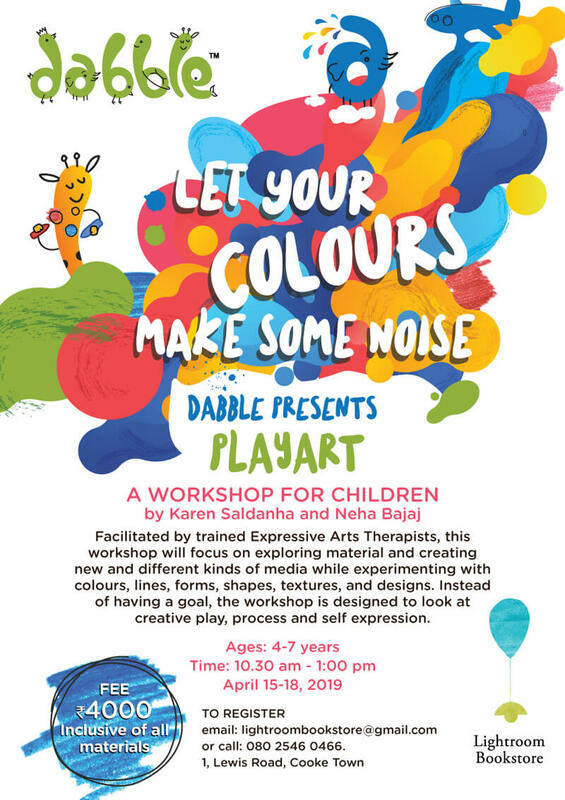 Dabble presents Play Art Workshop for kids. Let your colors make some noise this summers! Watch your little ones explore material and create new and different media. Let them explore and experiment with colors, lines, forms, shapes, textures and designs. The workshop aims at creative play, process and self expression. Kala Art School in collaboration with Explorium center is presenting you a week long Soulful Art Workshop. 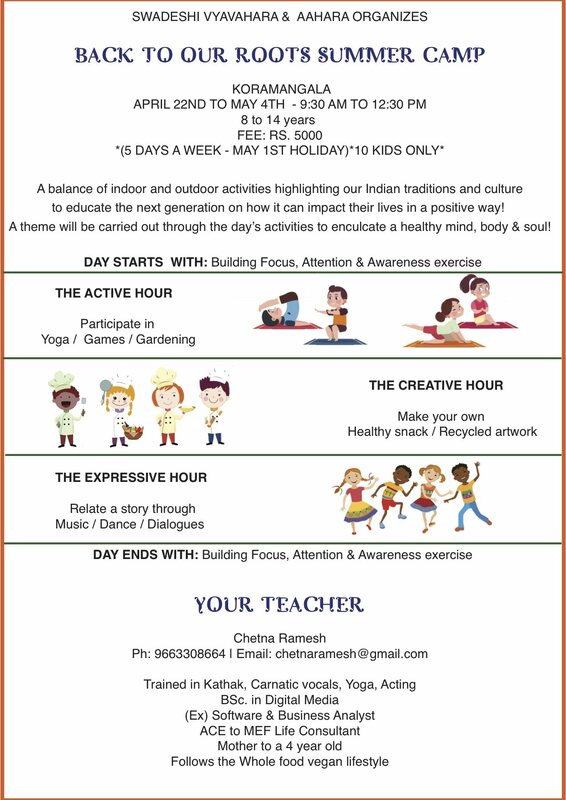 Let your children learn various forms of arts in this vacation to enrich their souls. 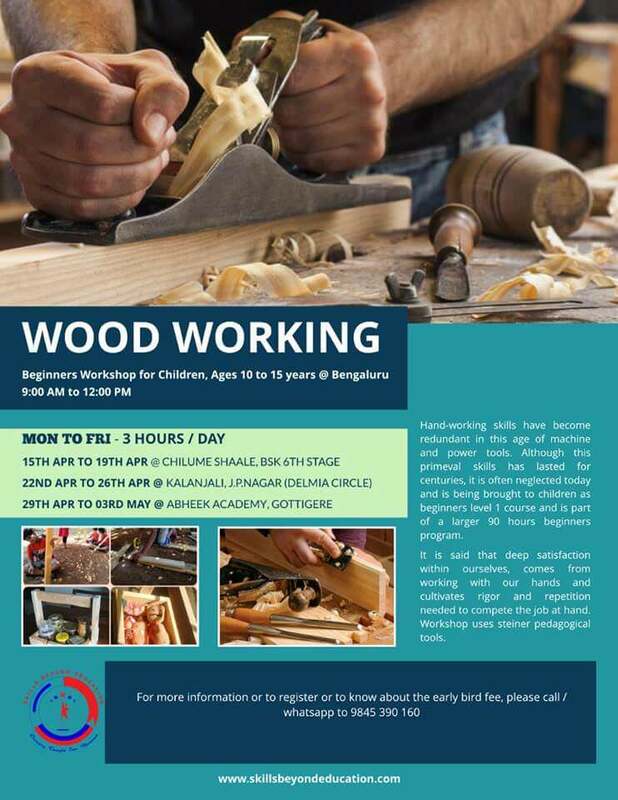 They have a wonderful set of workshops on arts & crafts for five days each in three sets. 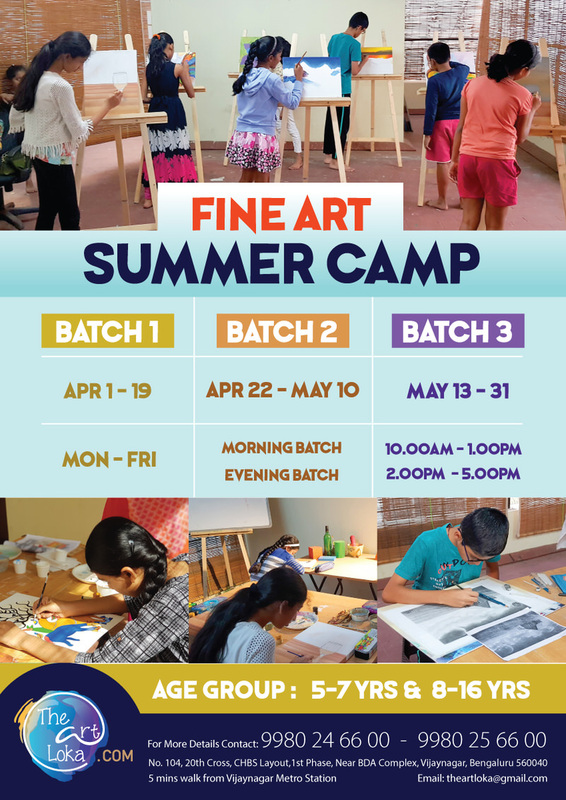 The Art Loka is coming up with one of the best summer learning program " Fine Art Summer Camp "! Children can learn innovative art forms from professional tutors. They will give personal attention to each child and moreover, they have a classic ambiance with ample space. Art work done by all the kids will be displayed proudly at their gallery at the end of the summer camp. 6 Learn traditional styles of art and craft! 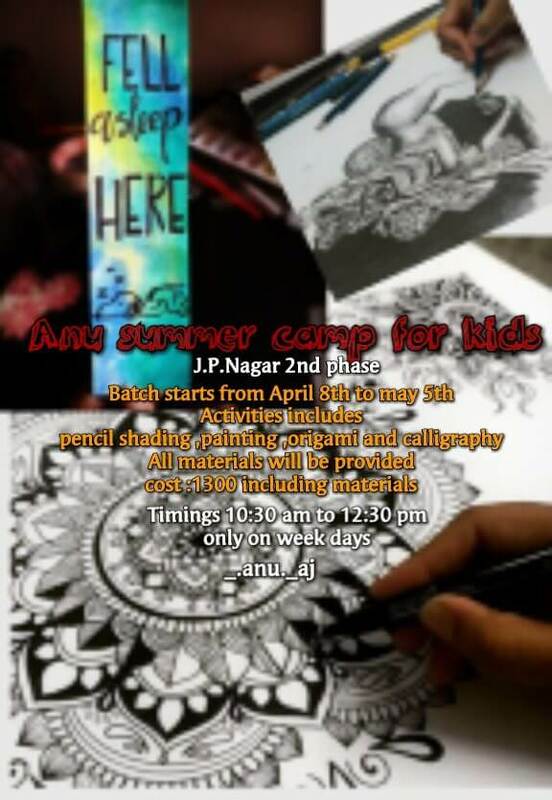 Madhubani, Warli art, Gond, Mandala, pot painting and so many more art forms are waiting to be discovered in this beautiful art camp! 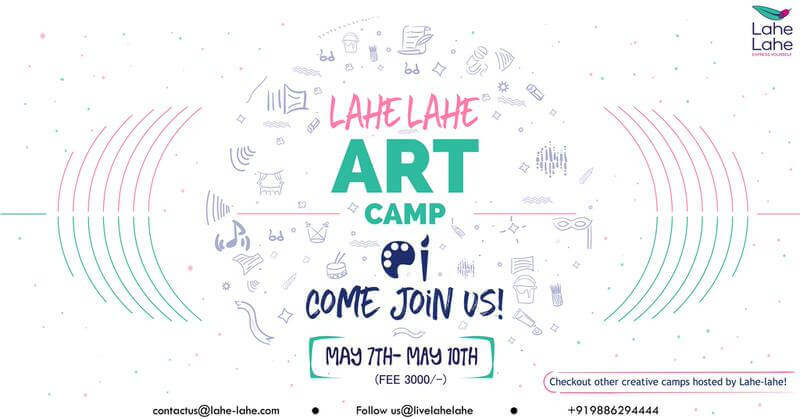 Lahe Lahe Art Camp: Colour Me Crazy is dedicated to developing, stimulating and inspiring creativity in the Visual Arts for youngsters encouraging self-expression. The program supports campers in discovering and developing their art practice and sense of self. Dwelve into the world of art and craft & artists from across the world. Explore some of the world famous artists and their work like Jackson Pollack, Joan Miro and many more at Doodle Magic World Art Workshop. Children will use different mediums like Acrylic paints, canvas, air dry clay, construction paper etc. 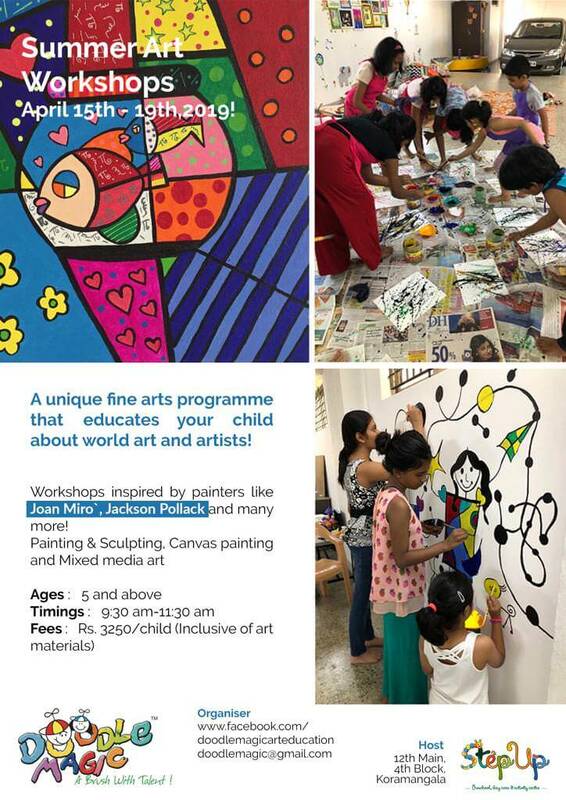 Adventures in Art & Animation Summer Camp is for kids above 5 years of age where they can choose from a huge variety of activities and learning such as professional pencil strokes, painting, chess, handwriting and music. Anu art classes aim at improving your child's creativity and skills. 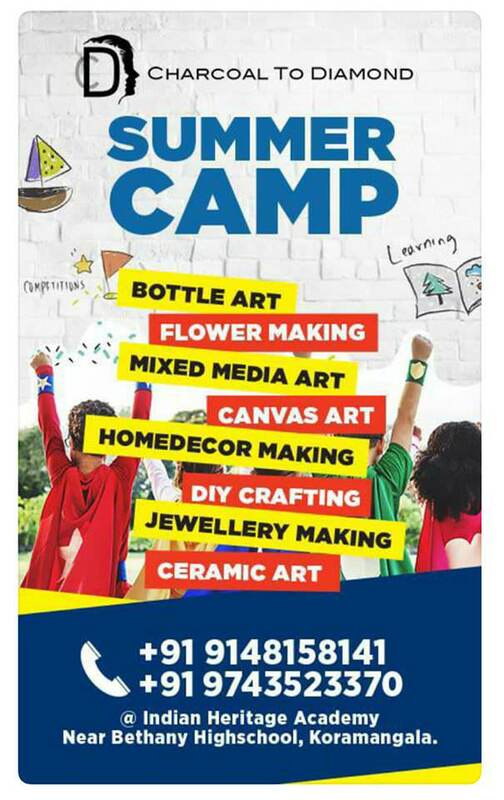 The camp has planned various art forms which your child can enjoy and master over this summers. 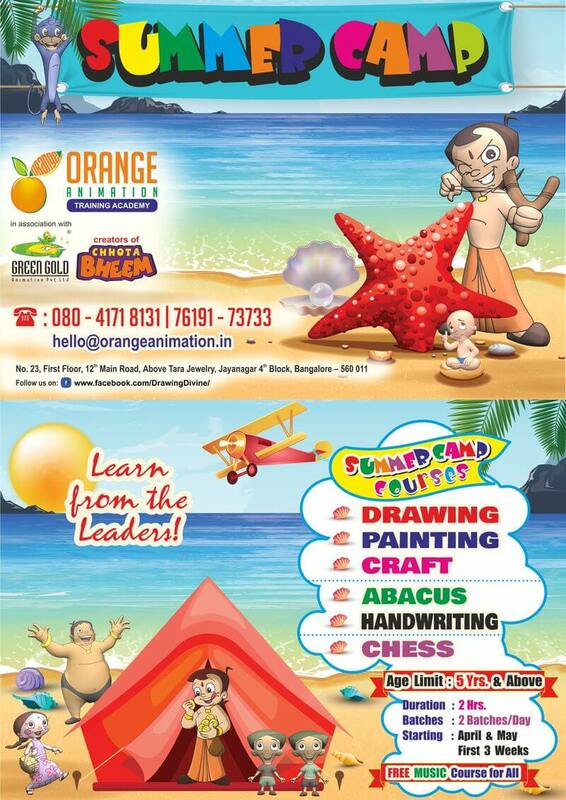 Children will learn Pencil shading, Painting, Sketching, Origami and Calligraphy. 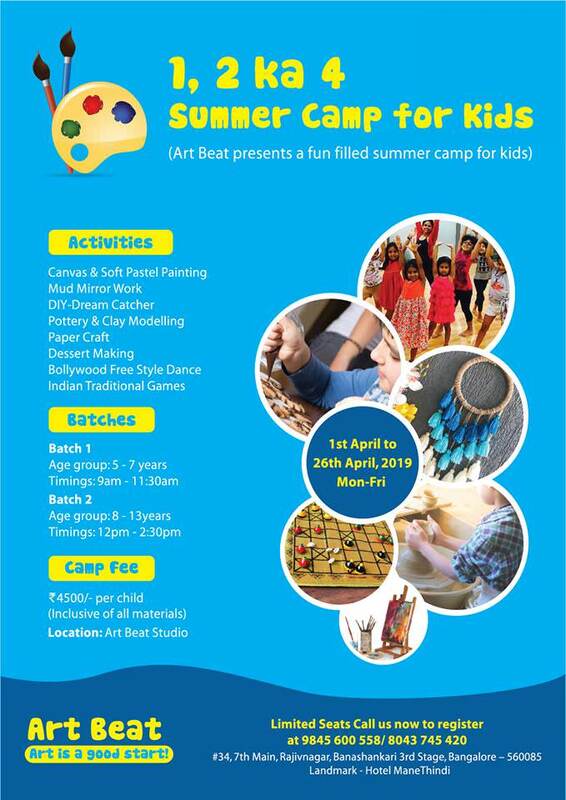 Let your child's imagination run wild with this creative camp that will teach them to paint Madhubani/Mithila art forms, make Puppets, art with pebbles and so much more. This along with some yoga, music and dance to kick in some energy. 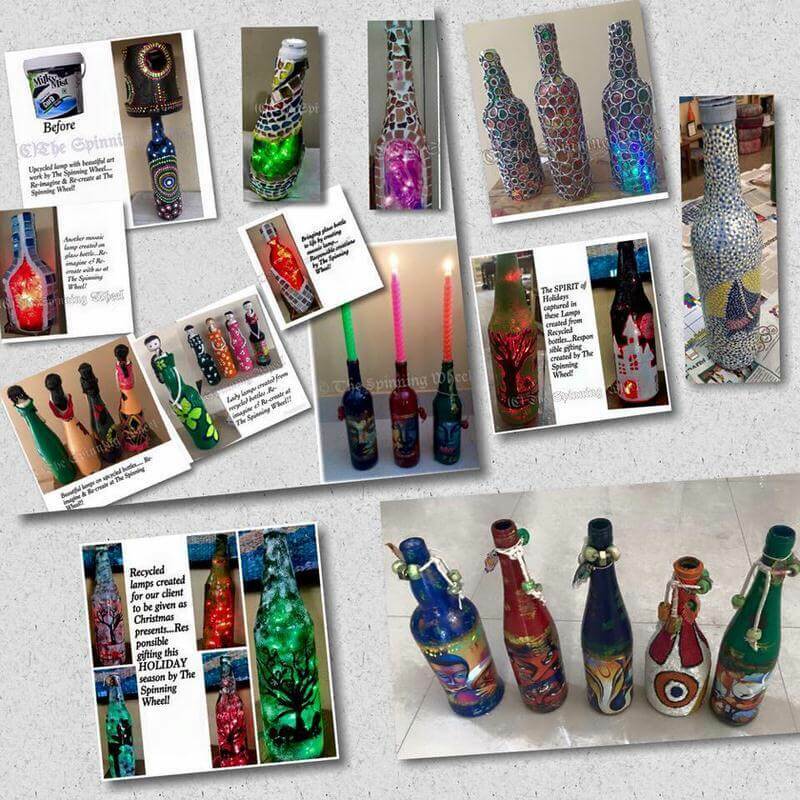 At Charcoal to Diamond Art Summer Camp, students will learn 8 different courses Bottle Art, Flower Making, Mixed Media Art, Canvas Art, Home Decor Making, DIY Crafting, Jewellery Making and Ceramic Art. 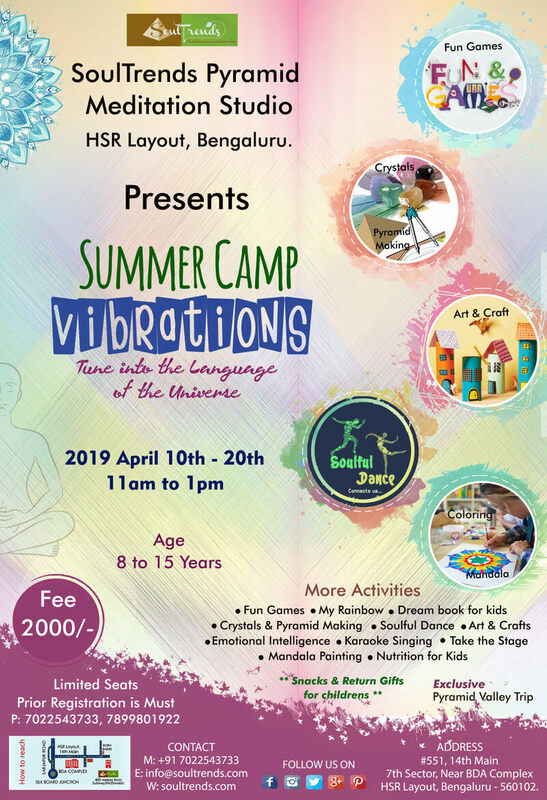 Vibrations Summer Camp is focused to give a holistic fun experience to the kids to stimulate self awareness, emotional intelligence, brain stimulation and individuality. 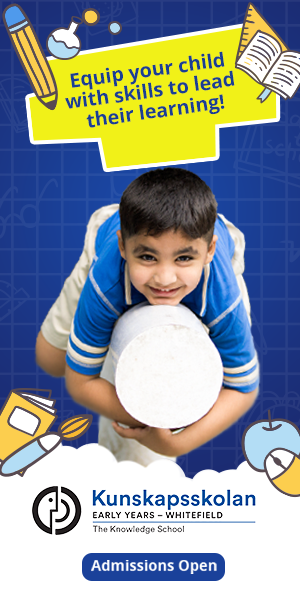 So, in long run, these activities equip the child with the skills to thrive in a challenging situation. They can eventually grow and learn while they stay calm and focused and go through life effortlessly and that too with all the fun factor! 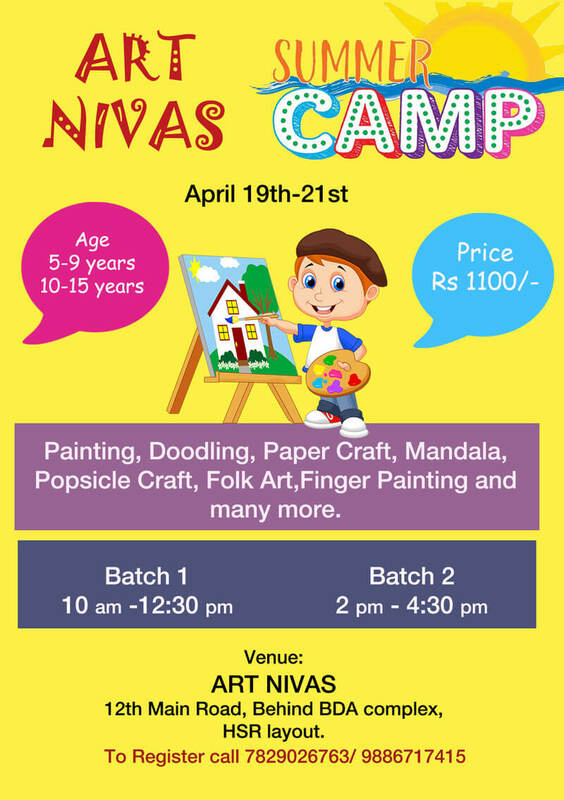 Art Nivas Summer Art Camp is an exciting camp, where children can have fun while learning various art forms like Indian folk art, doodling, pot painting, mandala, paper crafting, finger painting and many more. 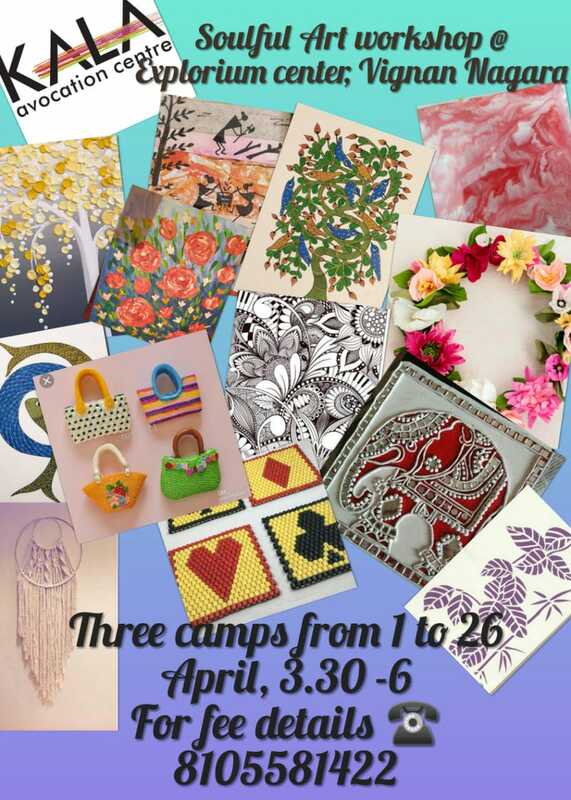 Work wonders with your hands at this craft camp. Learn to do quilling, origami, Puppets, jewellery and much more. This is for kids as young as 3 yrs as we know how such activities are excellent for developing motor skills. Enroll today!